Sometimes these things mate and make delicious babies. Peanut butter and chocolate is one of our best inventions as a species. Pretzels and chocolate aren't too shabby either. A few years ago there was a woman, nay Goddess who was working at Marion Street Cheese Market. She was making a dark chocolate bar that was studded with aged gouda. It was my precious. Unfortunately she ended up leaving the shop and I have not been able to find her or her delicious chocolate concoctions since then. For years now there has been a profound emptiness in my heart and tummy. Last month I discovered something delightful. A treat that could possibly fill the void. A chocolately treat of magnificence. 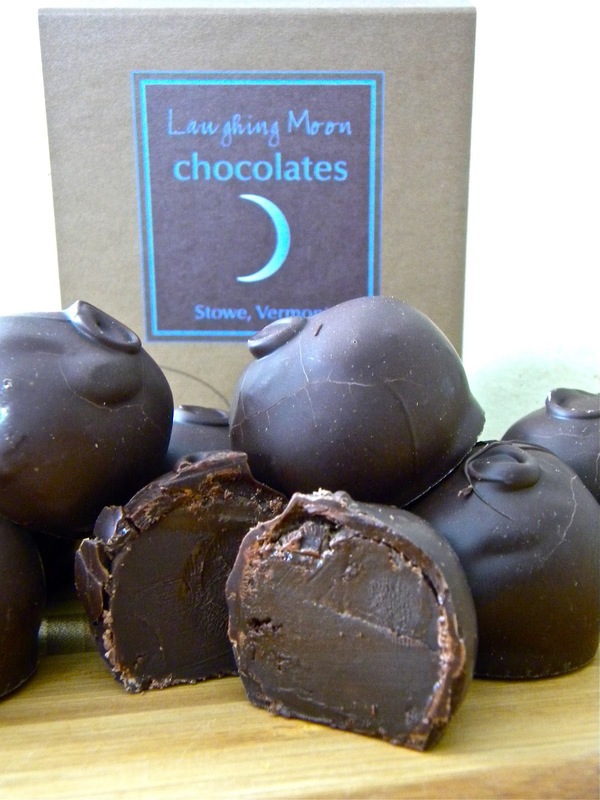 Laughing Moon Chocolate from Vermont makes some very delicious chocolates and they have a bonbon/truffle/callitwhateveryoulikeitschocolategoodness that is blended with Bayley Hazen Blue from Jasper Hill. As you all know by now, Jasper Hill makes some of the most delicious cheese around. Their Bayley Hazen Blue is a natural-rind cheese with a crumbly dry texture that can make cutting it into pretty wedges a bit challenging at times. It has a lovely butteriness to it and tastes kind of fudgy. Yup. It's a cheese that already tastes a bit like chocolate and has that dense, chewy fudge texture. The combination of the cheese and the chocolate should be as symbiotic as any two foods can be. And it is...mostly. The chocolate shell is thick and has a great snap to it when you bite into it. The interior truffle is luscious, silky and smooth. It is by all counts a delicious treat. There is just one itsy bitsy small problem. It's not cheesy enough. In fact, after eating one truffle I didn't get a lot of blue cheese flavor. In the second truffle there was a bit more. By truffle number three (I sacrifice so much for you guys) I was getting a bit more, but it just wasn't cheesy enough. The texture is definitely dense and fudgy, but I need more cheese. I had a few friends blind taste test the truffles, and they thought that there was something unique about them, but couldn't quite place what it was. When I told them the truffles had BHB in them everyone was surprised and not one had guessed that was the magical ingredient. Now don't get me wrong, the chocolate is freakin' divine. The next time I get them I think I'll add them to my cheese board I'll just make sure there's an extra sliver of blue cheese nearby. First new cheese of 2012 is conundrum from Jasper Hill. 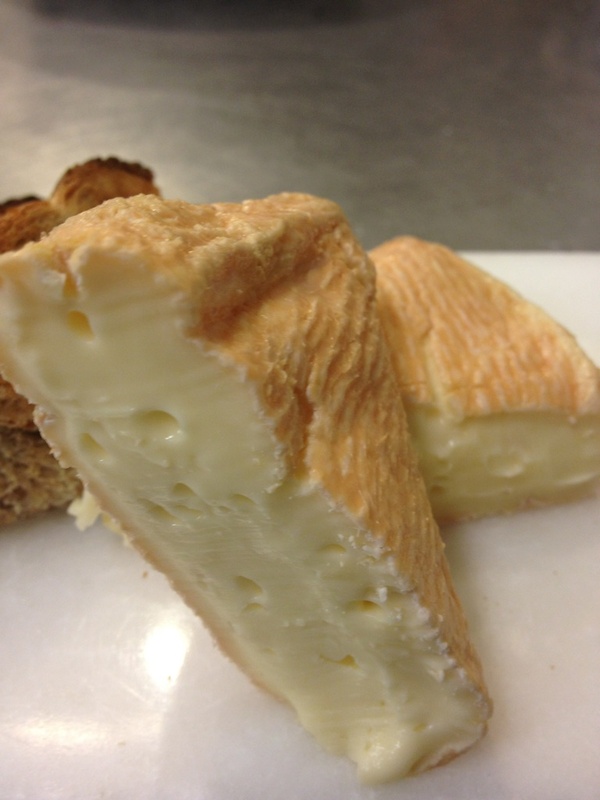 A washed rind cheese very similar to Moses Sleeper. Very buttery on the palate with a little funk on he nose. A good whey to start the new year! More on Jasper Hill to come.